It's been at least a year since I've done a painting of the courthouse. This commission was a welcome reminder of one of my favorite buildings, something about all that white is just so fun. 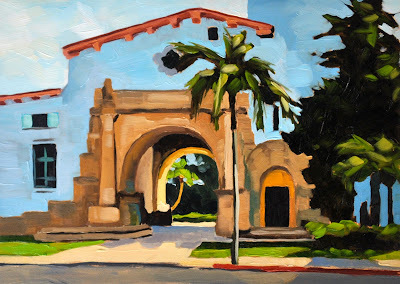 The Santa Barbara Courthouse is one of my favorite subjects to paint. I love the color of the shadows on such a white building. I got up extra early this morning to paint, because the rest of my day with be spent in LA, watching the filming of the Glee finale! My best friend acquired free tickets, it's going to be awesome!